16 x magnification and 52 mm objective lens provide a wide field of view.Focusing in on your target for brilliant detail at 1000 yards out. - Adjustable eyepiece lens and focusing ring make the observation more accurate and more convenient. -Adjustable eye cups can be twisted up and down for optimal viewing with or without glasses . - All lenses are made from Bak-4 prisms with FMC multi-layer broadband green film, the light transmittance increases up to 99.5% for brighter and higher-contrast images. -Low Light Night Vision :Can be used for both day and night (Can't see anything in complete darkness). - Use rubber O-ring to fill all seams so that it can prevent water splash and dust goes into the lens. (Do not submerge into water foe long time). Non-slip Rubber Armor - Absorbing shock and providing a firm grip. 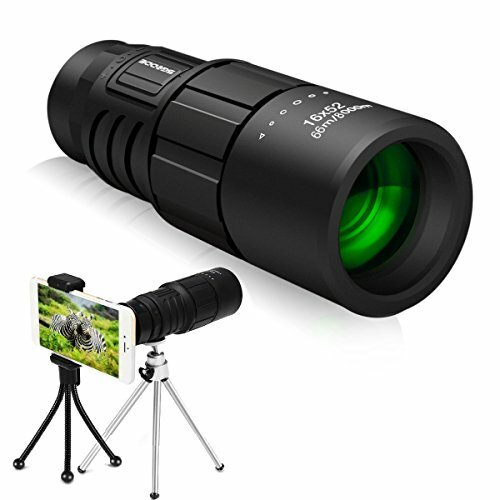 -Come with a anti-slip phone adapter .You can use it to connect your phone to take pictures and video, equivalent to having a telephoto lens.